New York seems so long ago now. A distant memory. Yet, it was only a month ago Katy and I spent five days pretty much wandering to find food..and the pretty houses, and beaut sights too. But mainly for food right 😉 We had some incredible brunches, dinners, snacks and treats and drank at some of the cutest coffee shops and bars! Literally a week dreams are made of. This is the first brunch stop we made on our trip. In fact, it was the first stop full stop. Setting president from the start. 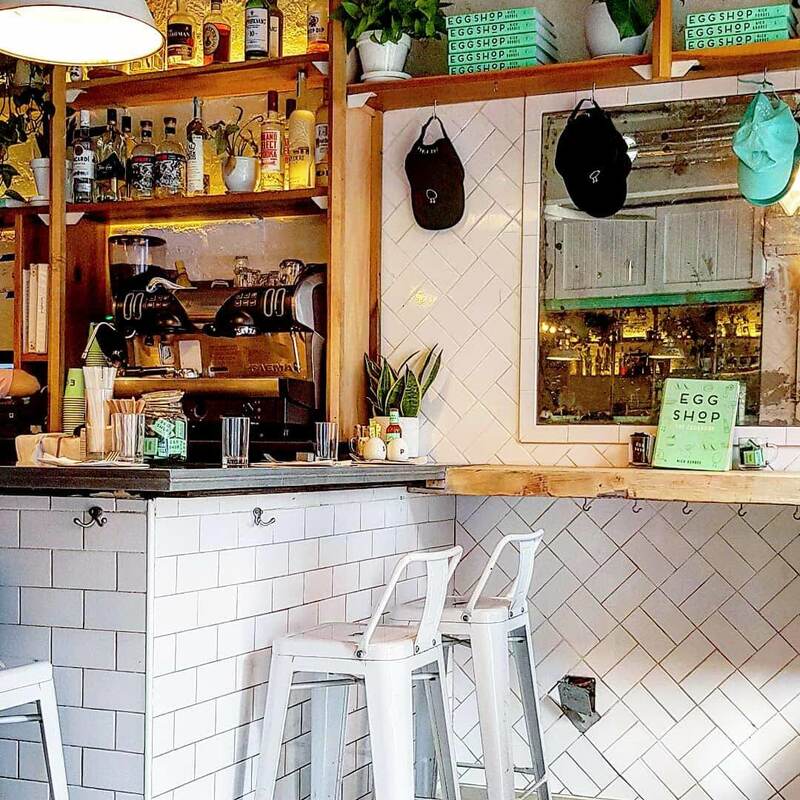 It’s a super cute plant-based restaurant with a handful of locations – it’s contemporary, minimalist, bright with plenty of foliage (New York sure had lots of this!). Food was fresh, vibrant and full of flavour. Just what we needed after a long haul flight. The menu had plenty of options I was dying to try. Both dishes we ordered (after much deliberation…the long haul flight definitely caused more indecision than normal) fantastic and delicious. ‘The Best Kale Salad’ ($18) (yes, that is what they named it), was crisp and crunchy with a fab mix of fruit and veg. 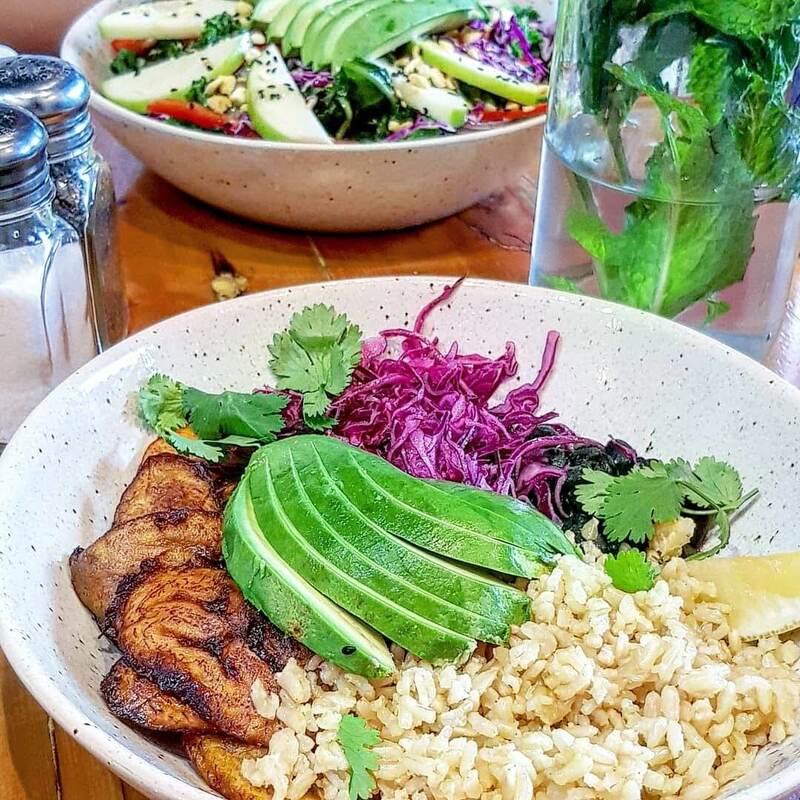 The Plantain Party Bowl ($16), a beautiful mix of soft rice, black beans, red cabbage, slightly sweet plantain and creamy avocado. Service was friendly and fast. It’s a juice bar too. The juices looked fantastic, although a little pricey at about $10 each. Day two, we kept the brunch momentum going. Walking over an hour to reach our destination of choice, it needed to live up. And it did. The Egg Shop is another cute location. Much like The Butchers Daughter, it’s pretty minimalist, bright and airy, with plants filling the spaces. I started realising that New York restaurants and houses had cottoned on to the Instagram trends! Service wasn’t quite as friendly as The Butchers Daughter, but was still fast. The menu is predominantly based around, you guessed it, eggs. The whole brunch menu featuring eggs in some way or another – not always the main element of the dish but always there in some form, sunny up, scrambled or soft boiled. The Avo & Egg ($14) was served with a soft-boiled one. It came with tahini, a beautiful thin watermelon radish, harissa, almonds and citrus salt all on multi-grain toast. I’d never had watermelon radish before, and it sure added a beautiful fresh element, to the creaminess and rich flavours of the other ingredients. 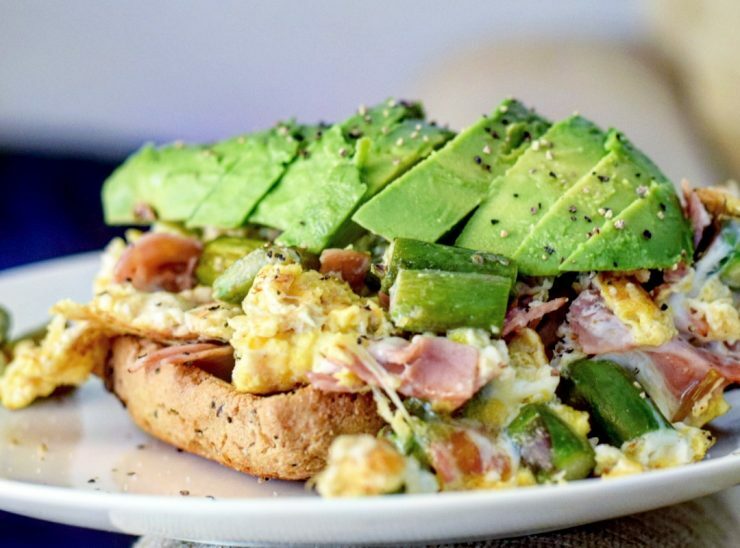 A fab Avo toast! The Scrambler ($12) was a superbly rich and creamy mix of, you guessed it, scrambled egg. When we visited it was scrambled with sweet corn, mushrooms, spring onion and pecorino. 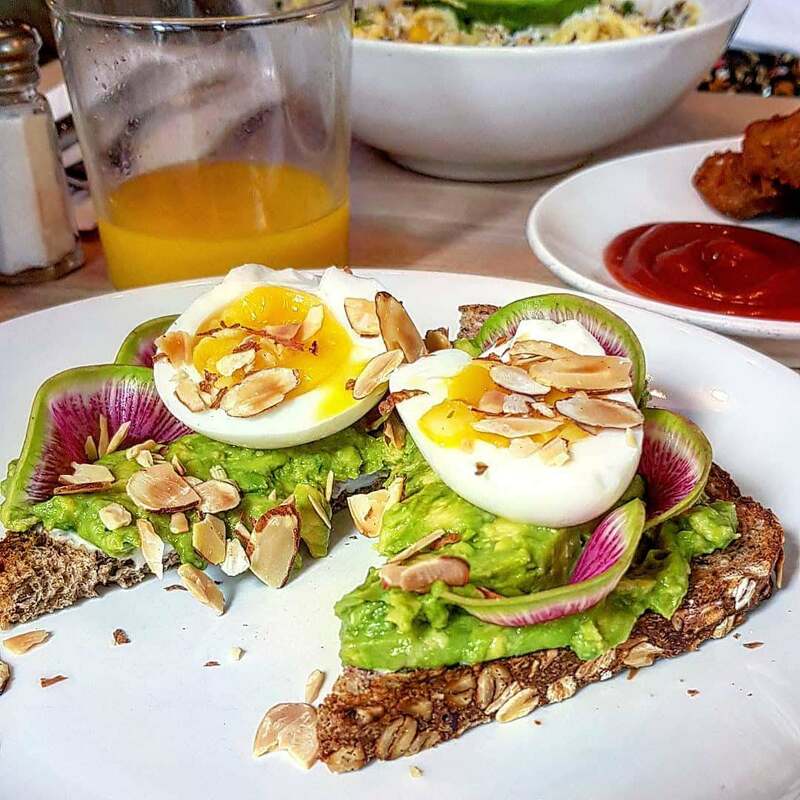 Katy added some avocado to top it off, because who doesn’t want extra Avo? The hash browns ($4), a side order, were handmade patties of fluffy middles, and super crispy outsides. They were fab! Definitely a nice change to the standardised versions you get. The ONE thing I promised myself I’d get. A bagel. 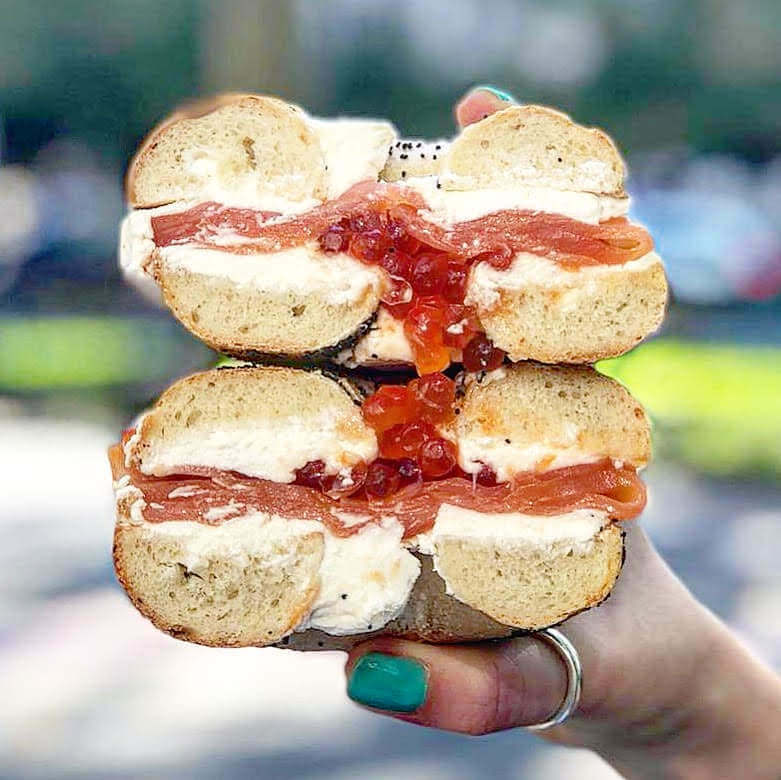 We went all out with one from a location recommended on many a New York bagel list as one of the best the city has to offer. 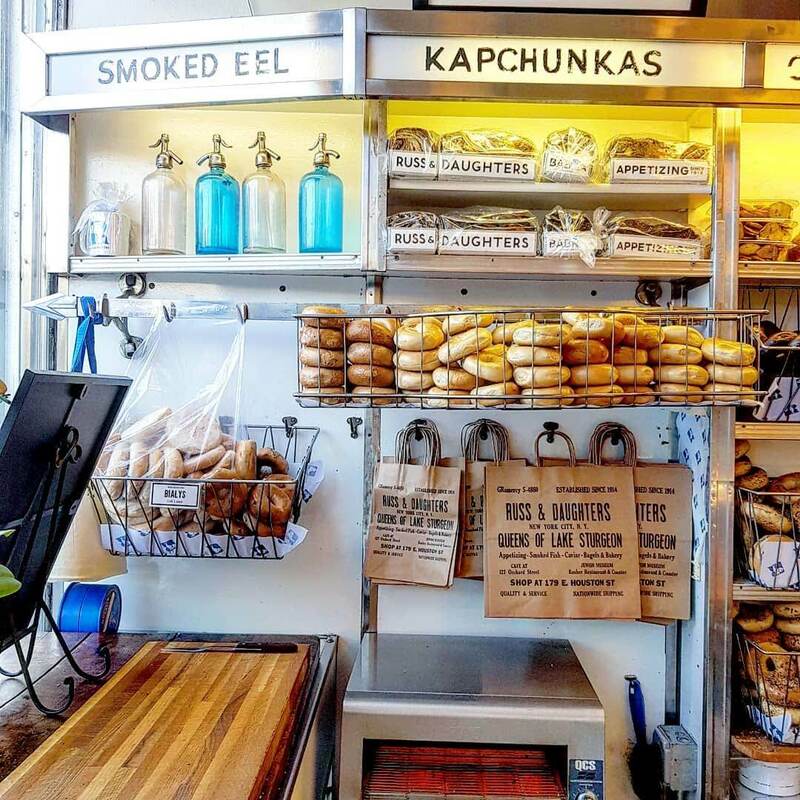 Russ & Daughters has two locations in the city, one a cafe the other a deli. The deli is the spot we ventured to. Perhaps not a location to take a veggie (sorry Katy), as there was a whole counter with fresh smoked fish ready for serving. Whoops. Although I quite enjoyed eyeing up the cakes, sweet treats and all the other bagel options – there were so many, and so many actual bagel types to pick from too! The only thing with the deli is that there isn’t anywhere to sit, so you either have to eat on the go, or find a spot outside to enjoy it (something we did find tricky to start). The bagels themselves are massive. Huge. The cream cheese is so thick and full of flavour (Katy had the spring onion one!) and they sure do fill the bagel as much as possible. My Daughters Delight ($19) with Gaspe Nova, Wild Alaskan Salmon Roe and cream cheese was divine. The salmon absolutely fantastic, the Gaspe nova added bursts of juiciness, and the cream cheese bringing it all together. Might be expensive, but worth every penny. It sure keeps you full for ages too! You can also make your own, which is what Katy did, with scallion (spring onion) cream cheese and tomato, which works out a lot cheaper at only about $5. This spot isn’t quite the diner you see in the movies. You know the ones I’m talking about. 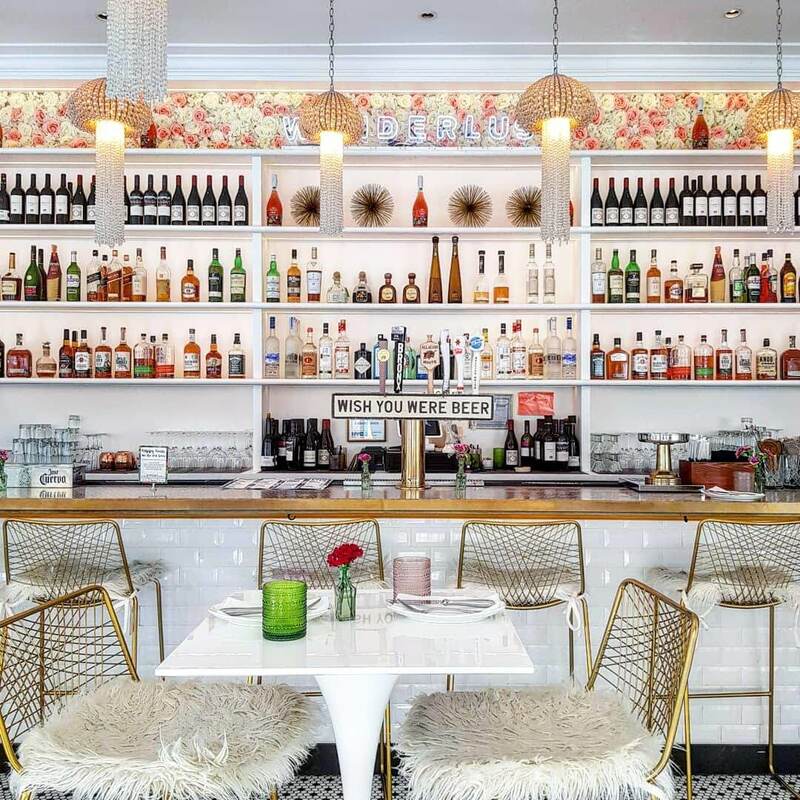 The standard spots with red booths, tiled floors, where people go late at night for a milkshake, or to find the person they’re looking for…as they always end up in their fave diner. 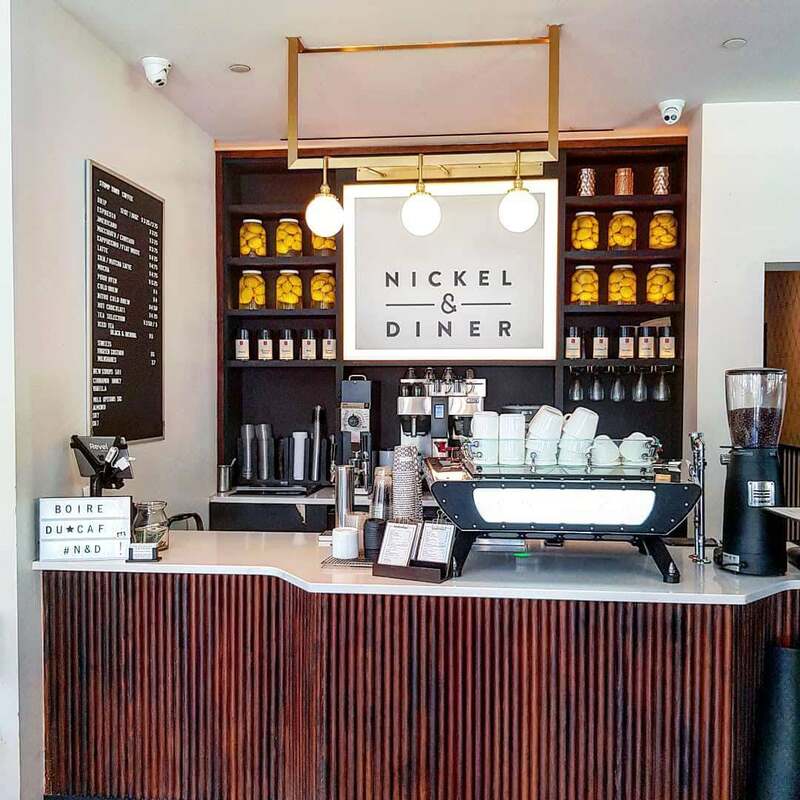 No, Nickel & Diner is a fancy, contemporary take on the classics, with dark woods, blues and copper throughout. It’s fancy inside. Gorgeous. The bar running the length, decked out with low hanging lights and metallic bar stools. Stunning. The service was top notch too, friendly, attentive and speedy. 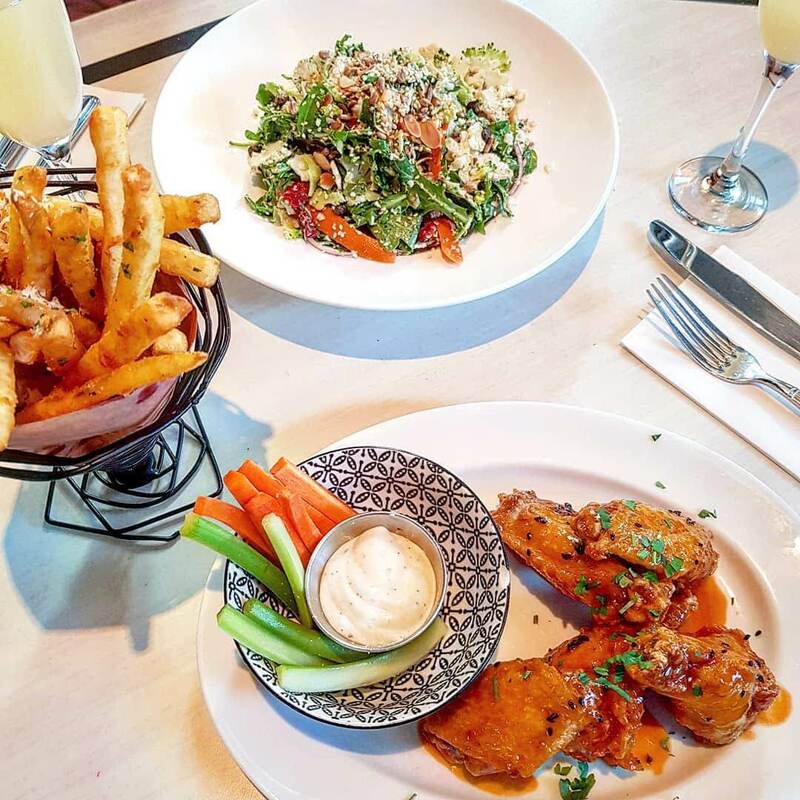 The daytime menu isn’t just about greasy burgers or grilled cheese and shakes either, it features a mix of dishes, including all day breakfast plates, soups & salads, pasta & grains, burgers and sliders, and wings. The Fried Chicken Wings ($14) served buffalo style, were tender and flavoursome. They came with carrot and celery, perfect for adding a little freshness, and a creamy light blue cheese sauce for dipping. So good! 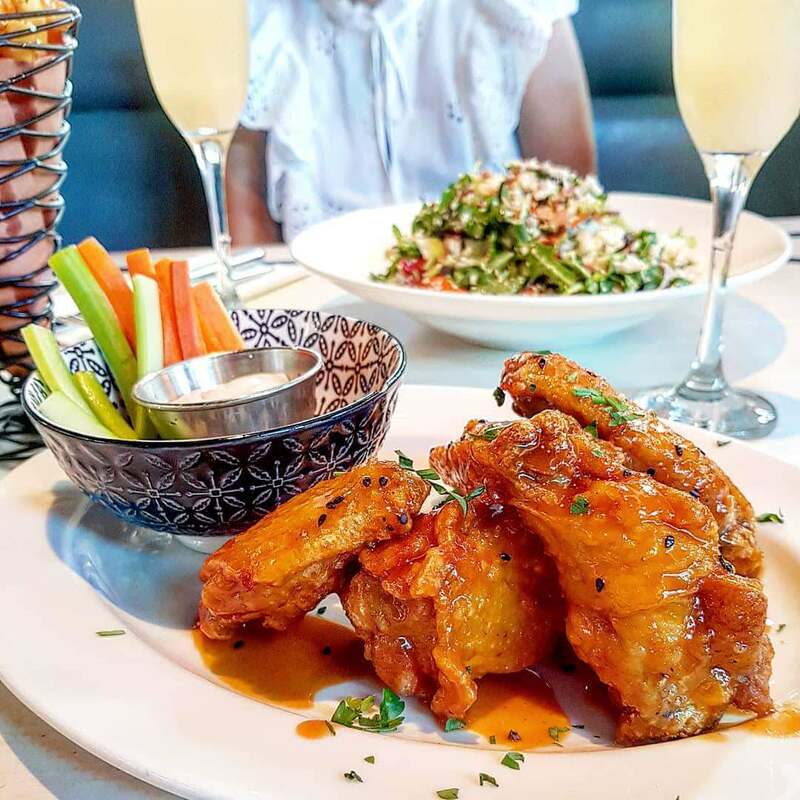 I was literally in wing heaven…I’m sure many of you might have seen the embarrassing video Katy recorded of me eating them over on Instagram! The shaved vegetable salad ($15) with broccoli, cauliflower, sunflower pesto and sesame, was another crunchy mix of delicious fresh flavours. I might have had a little food envy, as I do LOVE a good salad, but my wings were more than hitting the spot! 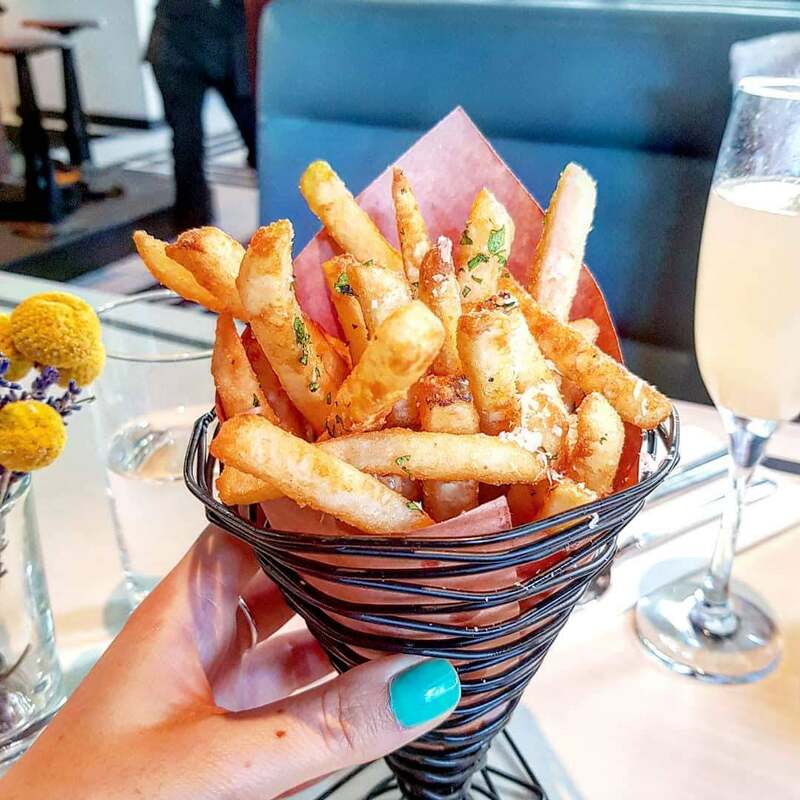 We shared some Crispy Fries ($6) too, because why not…they were great fries! This was a spot we stumbled upon during one of our long walks to start the day. A restaurant we kept in memory, both being big Italian fans! Pastai was set to be our one fancy stop during the trip – being a little more pricey than some of the other places we ate. And was worth it! The restaurant itself is pretty cute. It feels cosy, like a family run establishment. Almost homely. We nabbed a fab spot in the window amongst the leaves and pumpkins. The menu had plenty of different pasta options as well as antipasti, salads and seafood dishes. There’s also a specials menu, featuring seasonal numbers. There’s only one thing to do when they all sound so good – share. We started with homemade bread and oil which was tasty. 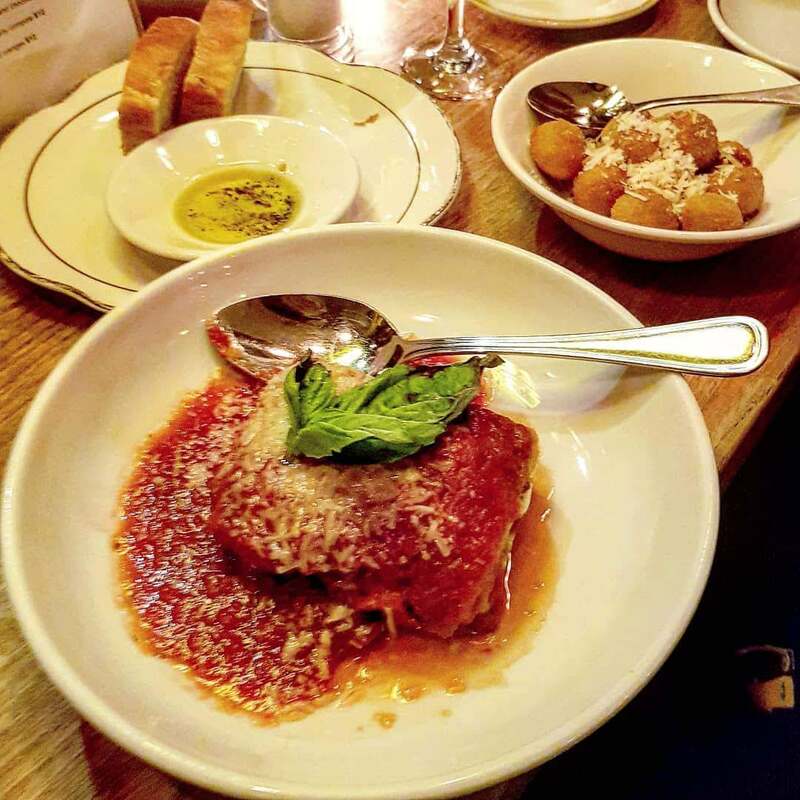 The Eggplant Parmesan special (~$14-18), in a rich tomato sauce was incredibly delicious, the aubergine (eggplant), not too soft, beautifully roasted. The Olive Fritte ($10), fried olives stuffed with pecorino, which had a light breadcrumb coating and were seriously delicious…creamy in the middle. 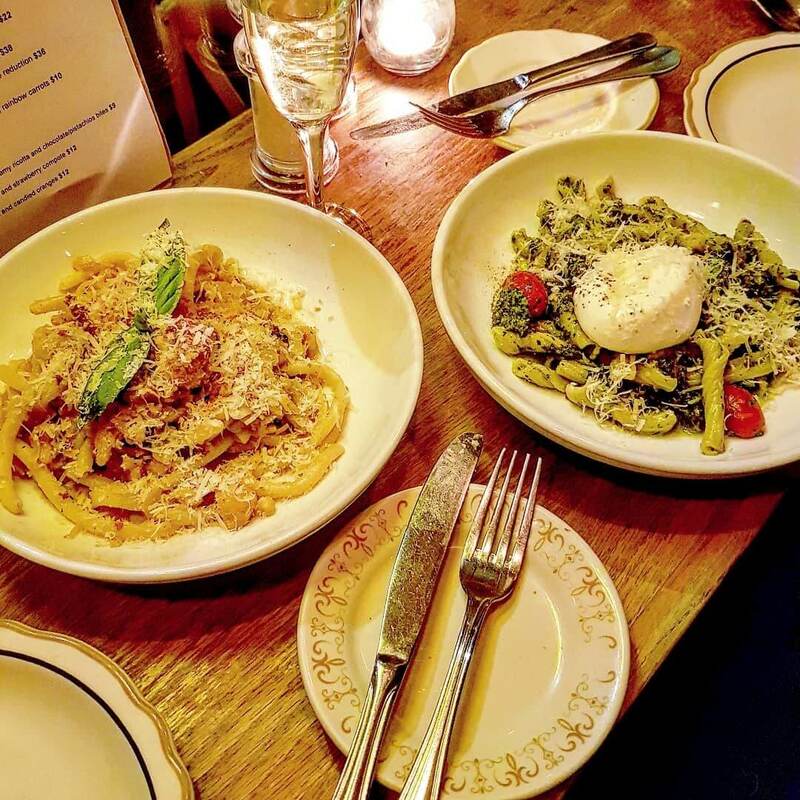 Both pasta dishes were beautifully present. The pasta was the perfect texture, and each dish was packed with flavour. The bucatini con broccoli ($23), was a mix of thick hollow spaghetti with cauliflower-saffron ragu, pine nuts, pecorino and raisin, topped with breadcrumbs. It was rich, creamy – pecorino makes everything a winner. 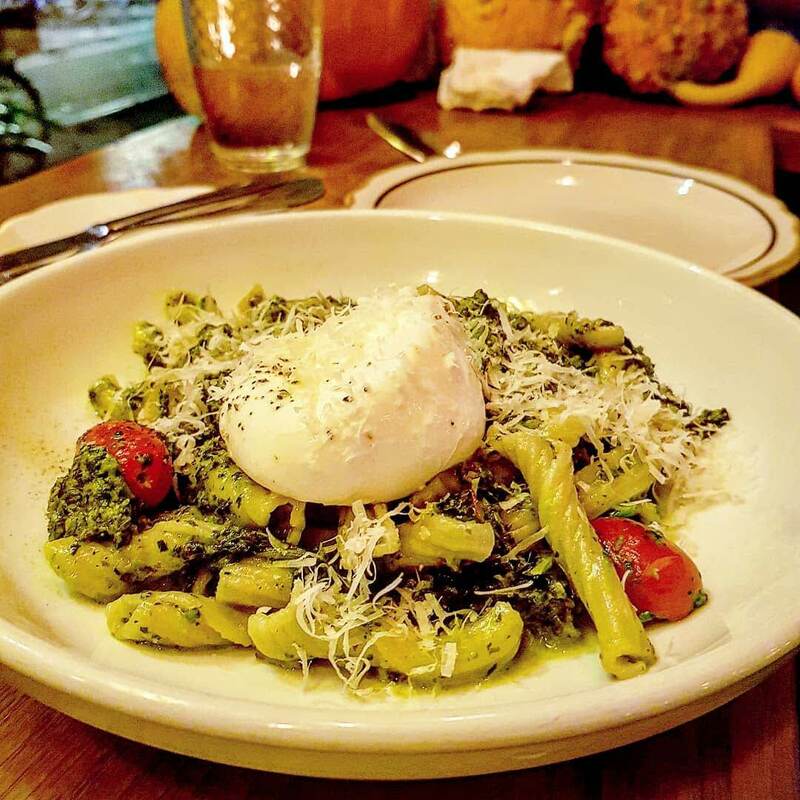 The garganelli pasta with burrata ($20), broccoli rabe, and garlic cherry tomatoes in a broccoli rabe pesto was nutty, and deep in favour. The mix of juicy tomatoes, creamy burrata and nutty pesto made for one incredible dish. Definitely one if you’re a pasta fan, and don’t mind spending a little extra. After all, it is a dream trip! You got it, this spot is the one for meatballs. It’s insane. The menu features pretty much that, although you basically build you own, choosing from 7 meatball options (classic, chicken, spicy heritage pork, veggie, salmon, maine lobster or special), one of the sauces (classic tomato, parmesan cream, pesto, spicy meat, yoghurt dill, lemon butter or special) and then whether to have it naked ($10.50) with parmesan and focaccia or in a bowl ($17.50), over a choice of side, served with two sides (or three if ou’re really hungry). 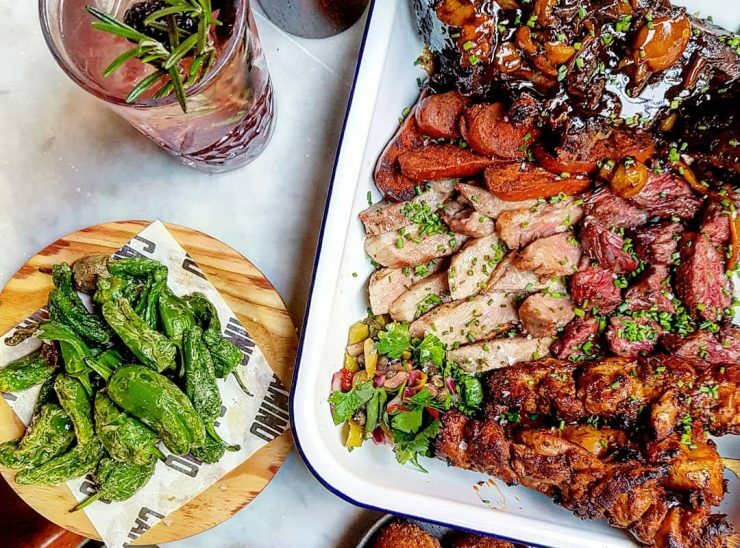 Sides include risotto, mash, kale and brussel sprouts among others, and there are salads and sandwiches on the menu too. The chicken meatballs were divine. So tasty. Fantastic in the rich, nutty pesto sauce! The veggie went down a treat too. And the Parmesan cream was another level. Creamy, potent, awesome. Perhaps a little sickly. But I’d still eat it all. The focaccia was just oily, and tasted fresh. A great accompaniment to the meatballs. I definitely recommend going down this route. 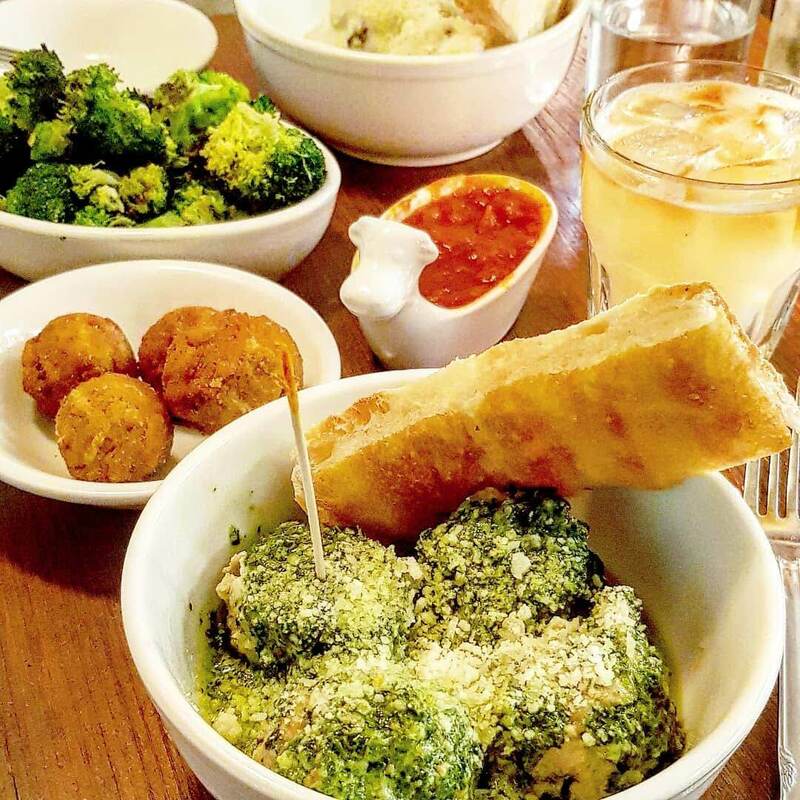 We couldn’t resist some broccoli ($7) roasted with chilli and garlic, it was beautifully a la dente – satisfied that veg craving. 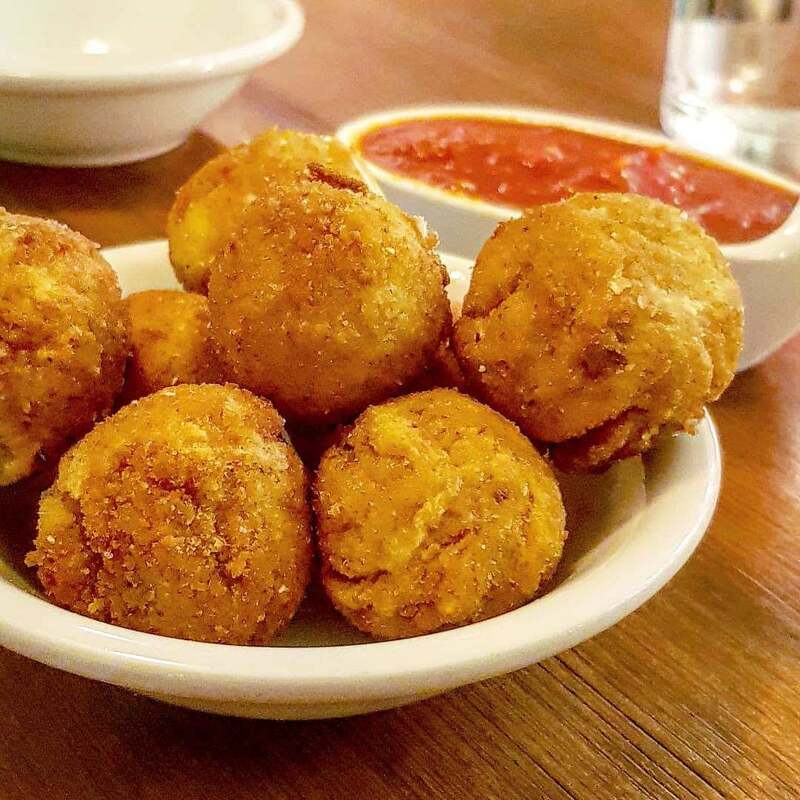 The mozz balls ($8) also called out to us – these were warm, oozy yet stringy, and super delicious with the tangy tomato sauce. Definitely something to add to the order. Service was pretty standard, although very fast – food was with us within about 10-15 minutes after ordering. We did feel a little rushed out after but assumed it was because it’s almost like a fresh fast food spot. Katy found this spot on Instagram. And looking at the inside, you can tell why it’d make a instagrammers pick. Wanderlust is super cute. Light, bright, white and metallic metals. High tables, flowers, furry seat cushions/covers, signs. You know the type. Wanderlust nailed it. But it doesn’t just look pretty, the service is the best we had in New York, super friendly, and the food was amazing. The menu is a mix of different cuisines, with everything from pizza and mac and cheese to vegan summer rolls, pad thai or poutine. 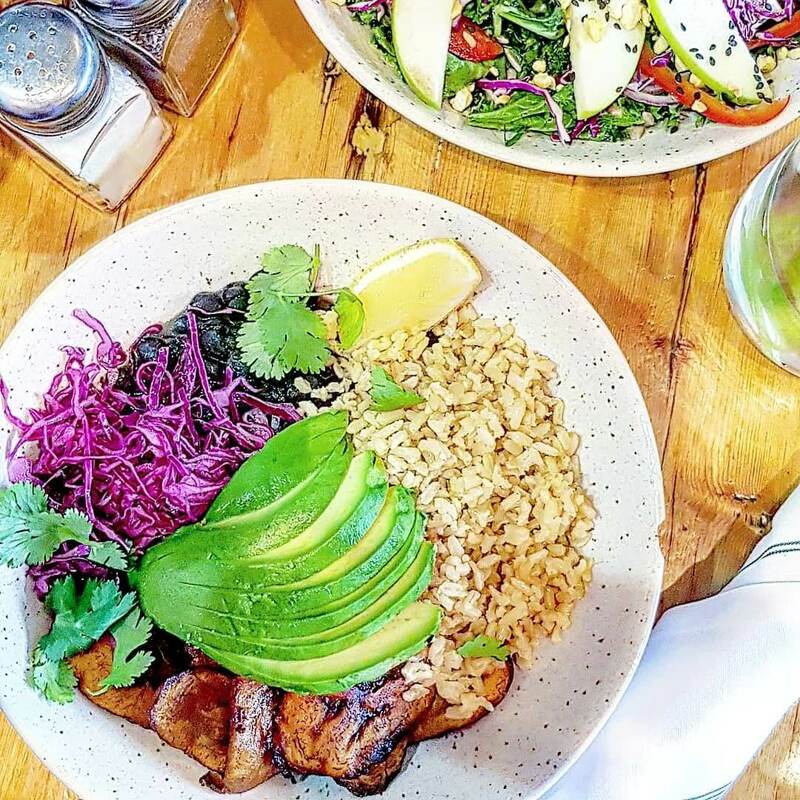 There are meaty numbers, veggie choices and something for vegans too! Feeling snacky, the Oh My Guac ($12), nachos with guac, are a must. They arrive red and yellow which looks pretty cool (no taste difference between them), salty, with plenty of creamy guac for dipping. 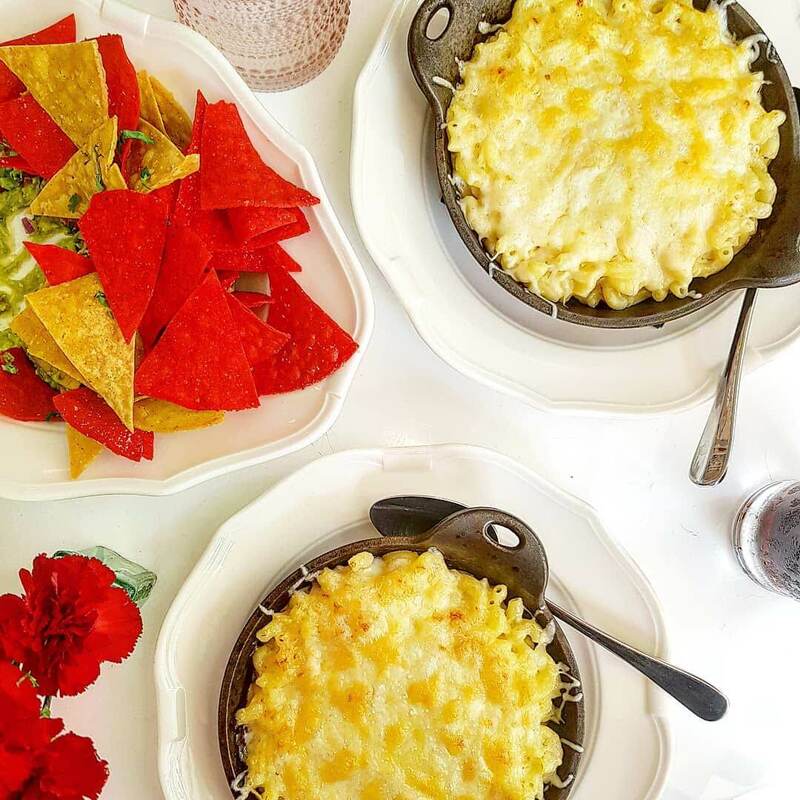 Both eyeing up the U’re the ma to my cheese ($16), basically, Mac and cheese made with emmental, cheddar, fontina and parmesan, we knew we couldn’t share this time. We just knew we’d be scrutinising how much each other was taking. 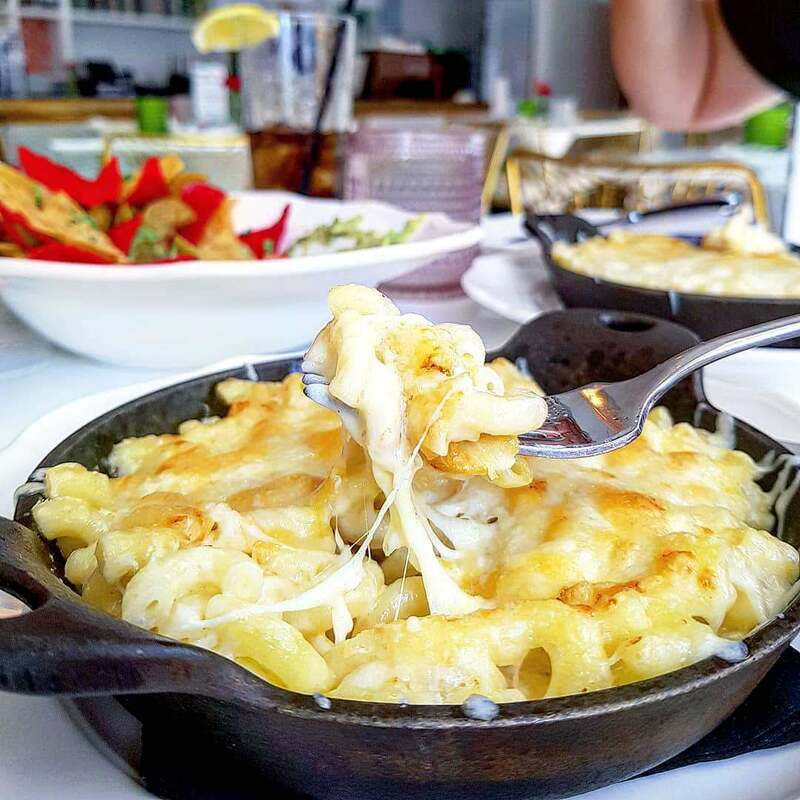 So a Mac and cheese each had to be ordered. We did not regret this decision. It was incredible. Creamy, seriously cheesy, oozy, gooey, deep in flavour with a fantastic crisp top. Stuff dreams are made of. Allowing space to rest – it was a super chilled spot during the day, and we weren’t rushed at all – we managed to squeeze in some dessert. 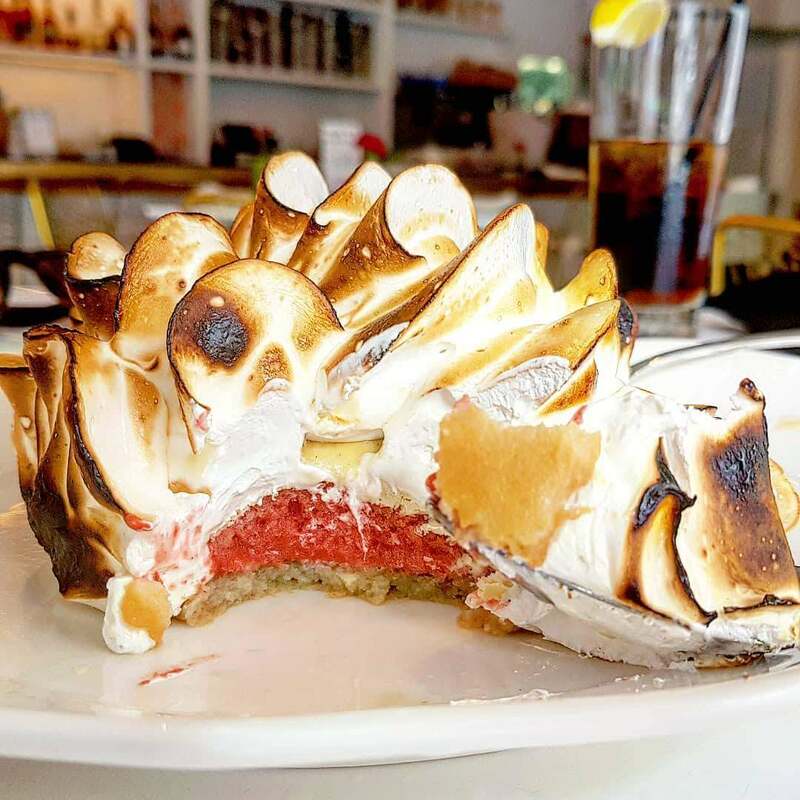 We were just dying to have a Baked Alaska ($16, for sharing). With a strawberry sorbet centre, and mascarpone ice cream, it was smoky and seriously indulgent. 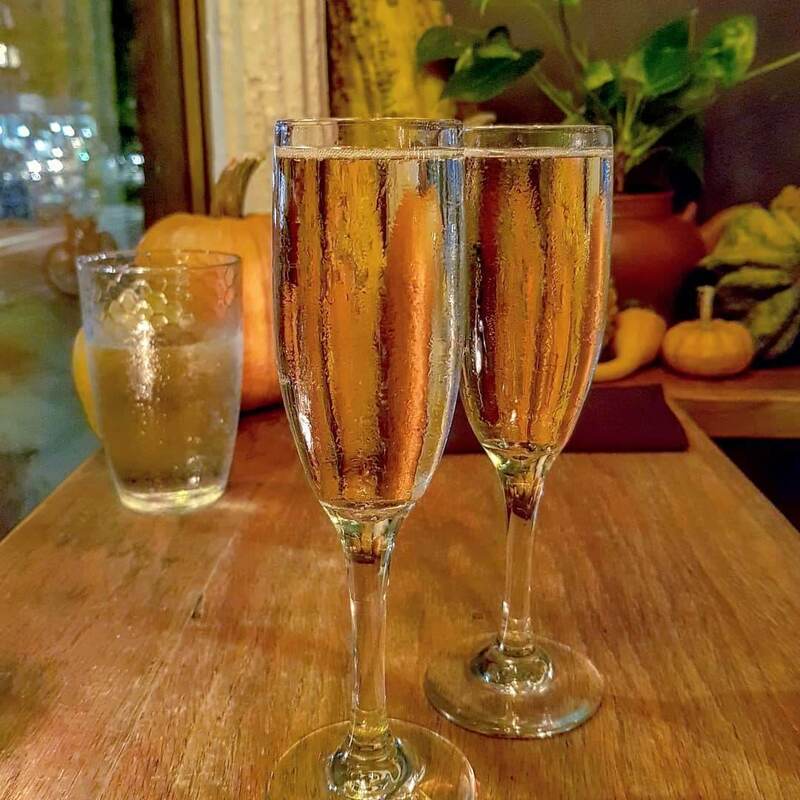 Service was not only relaxed and chilled, it was super friendly and helpful! The team were chatty and ready with recommendations. Katy and I even followed one of them on Instagram after! I’m a huge cereal fan, so Milk Bar was a must. 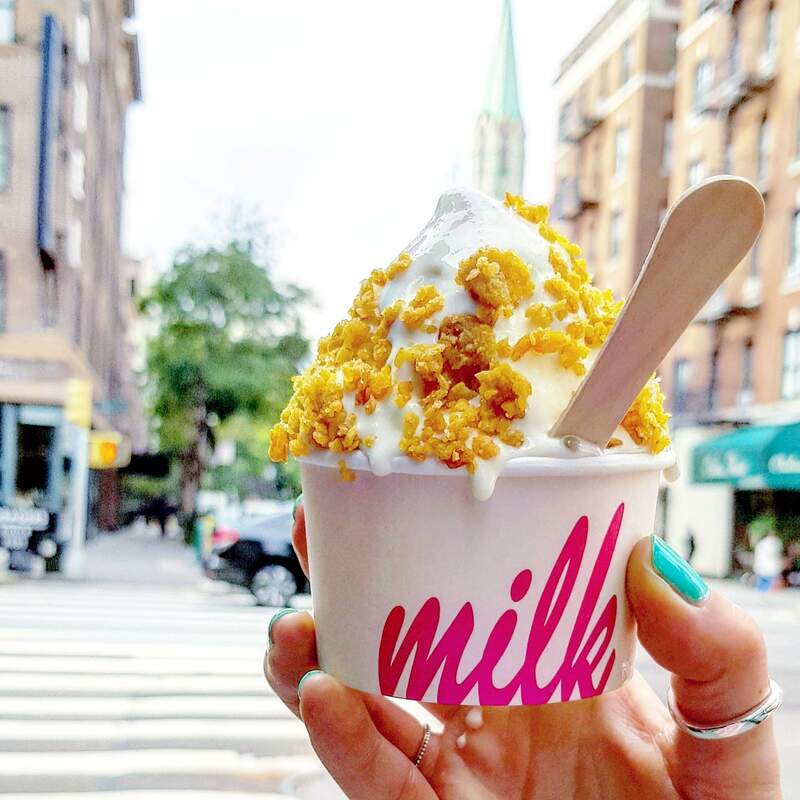 We went for a Cereal Milk Soft Serve ($5.50) which is basically soft serve made to taste like the milk at the bottom of a bowl of cornflakes, and served topped with crunchy cereal. It was different, that’s for sure. I couldn’t decide at first if I wanted something sweet with it, it being soft serve, but it grew on me. The cereal was pretty tasty (think sugary, crunchy clusters), and the ice cream itself was super creamy, and delicious. Might not be better than a truly decent vanilla bean, but fab in its own way. Definitely one to try on the go! 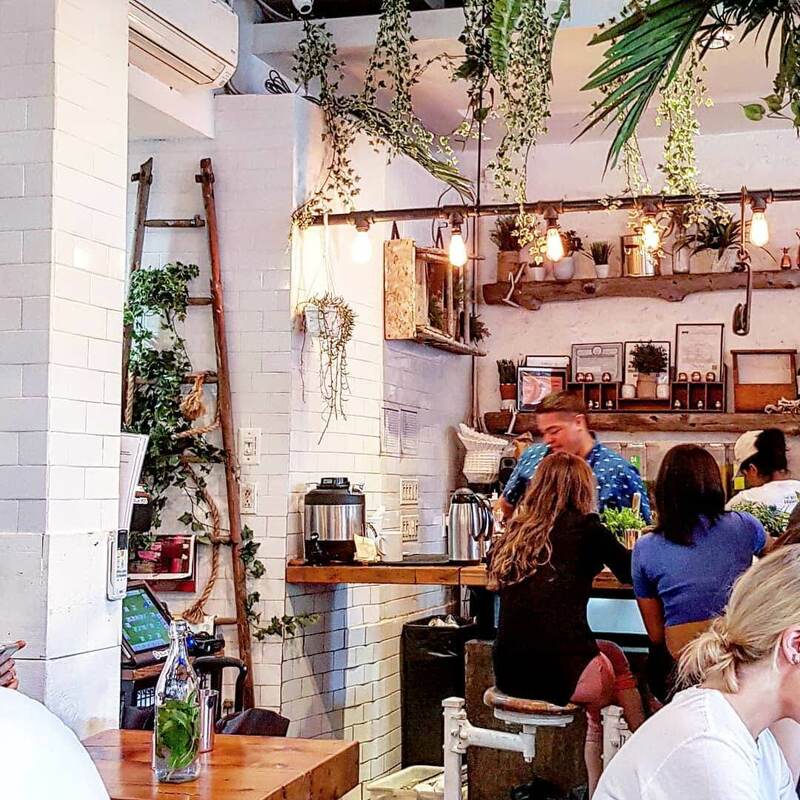 Pod39 will actually appear properly when I finally get round to sharing my drinks edit – all the spots for drinks and coffee – as it was pretty awesome. But I had to give Salvation Taco a mention here, because we tried a Mushroom Taco with pico de gallo and crema ($5 each), to keep us going on the last day and it was seriously dreamy! So tasty! 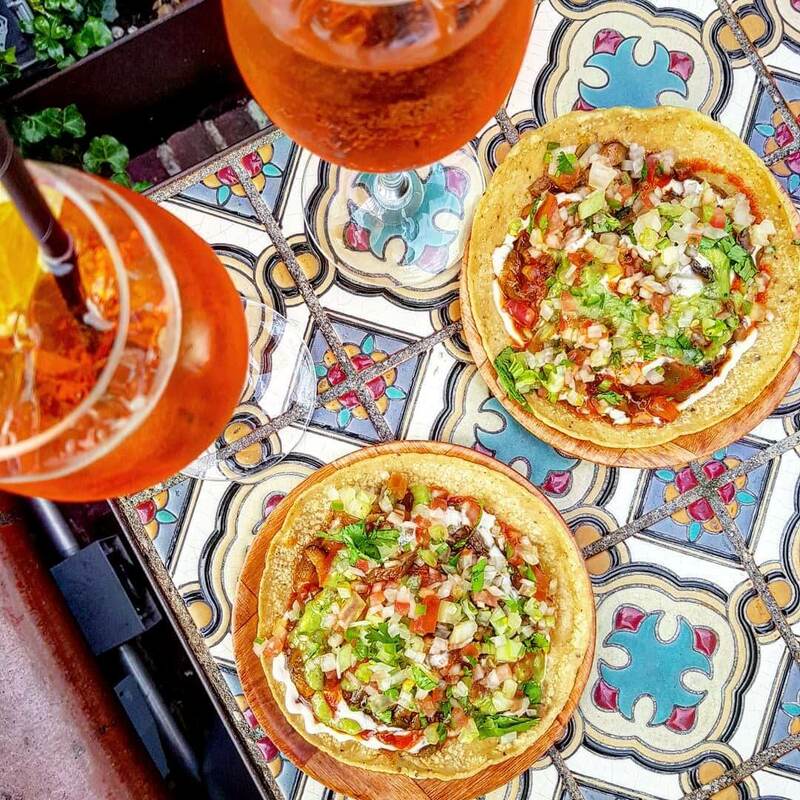 A great spot for drinks and nibbles – but be warned, they’re MESSY! Salvation Taco is one of Kelly Prince Writes favourites too! Go hungry. Walk to work up an appetite and eat as much as possible when out there. If you could only try three? I would say Russ & Daughters, Wanderlust and Meatball Shop. But that’s a tough call. They’re all SERIOUSLY good! Drinks edit coming soon…but I’m also off to Edinburgh this weekend! Where else should be on my list? 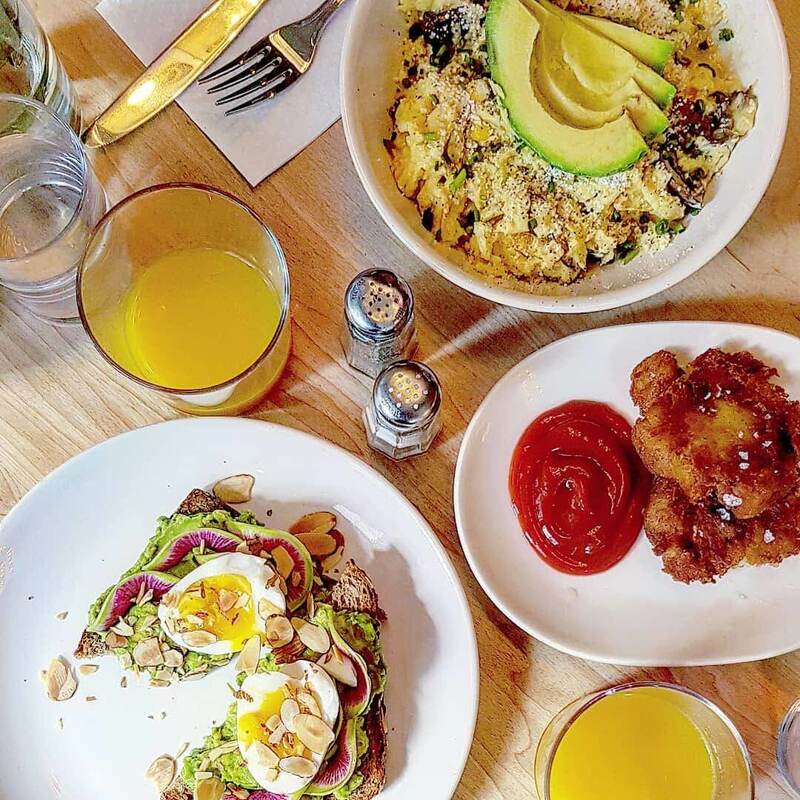 I wish I could go back to NYC just for the food – we were there for 48 hours and managed to tick off about half a dozen places on our list but there’s still so much more! Eeeeekkkk are you?! I AM SO JEALOUS. I’m going to be so envious watching all your stories. Hahaha the food is incredible! You’ll have the BEST time for sure!